What Are the Speeds of Tornadoes? Tornadoes are one of the most powerful and frightening threats produced by nature. Tornadoes produce winds that can exceed those of the most powerful hurricanes, but in a very concentrated area. These wind speeds can top 200 miles per hour and cause utter devastation. Meteorologists use the Enhanced Fujita scale to estimate the winds produced by tornadoes, based on the damage left in their wake. 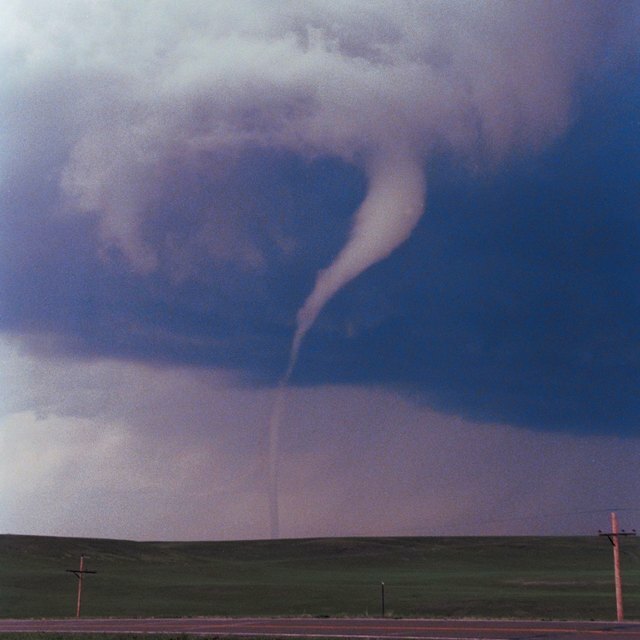 In 1971, Dr. T. Theodore Fujita created a six-category scale that classified tornadoes by the type of damage their winds produced. This Fujita scale ranged from F0 to F5, blending the Beaufort Wind Speed Scale with Mach numbers. The scale was used by the National Weather Service to rate tornadoes until 2006. In early 2006, the National Weather Service released a new, enhanced version of the Fujita scale, called the EF-scale. On February 1, 2007, this Enhanced Fujita scale replaced the original scale for use in all U.S. tornado damage surveys. It is based upon an expanded and more detailed examination of tornado damage, including eight levels of damage, called degrees of damage (DOD), and 28 types of structures and vegetation, called damage indicators. EF-0 tornadoes produce wind speeds between 65 and 85 miles per hour. For a traditional house of less than 5,000 square feet, these winds will cause the loss of some roofing material, gutters and vinyl siding. Mobile homes will suffer uplift of their one-piece metal roofs. Apartment buildings will show little signs of damage from EF-0 tornadoes. EF-1 tornadoes produce wind speeds between 86 and 110 miles per hour. Typical damage to traditional homes will consist of broken windows, significant loss of roofing materials, uplift of the roof deck and the collapse of chimneys and garage doors. Mobile homes will slide off their foundation and can roll or flip over, although they will remain intact. 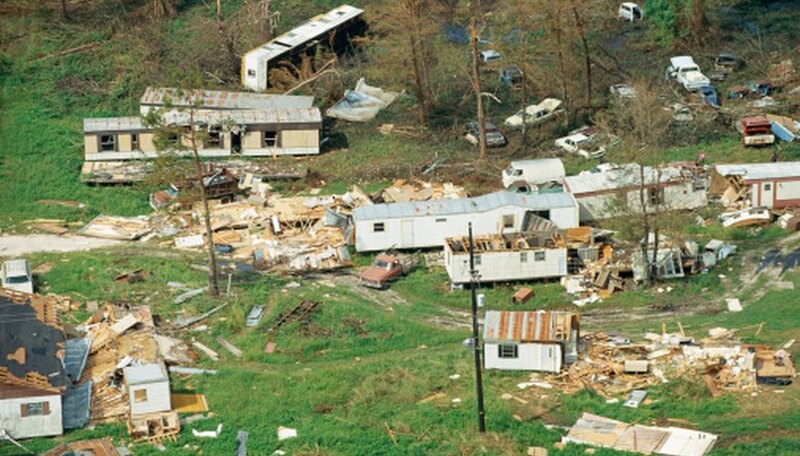 At the upper limits of an EF-1 tornado, complete destruction of the roof and walls can occur to a mobile home. Apartment buildings will suffer a minimal loss of roofing material. EF-2 tornadoes produce wind speeds between 111 and 135 miles per hour. A traditional home will shift on its foundation and lose large sections of roof. Mobile homes will be completely destroyed. Apartment buildings will experience uplift of their roof deck and suffer significant loss of roofing material. EF-3 tornadoes produce wind speeds between 136 and 165 miles per hour. Most walls, except for small interior ones, will collapse in a traditional home. Apartment buildings will suffer the collapse of their roof structure, and a strong EF-3 tornado will cause the collapse of most walls on the top floor. EF-4 tornadoes produce wind speeds between 166 to 200 miles per hour. These winds will collapse all the walls of a traditional house. Apartment buildings will suffer the destruction of their top two stories. EF-5 tornadoes produce wind speeds that exceed 200 miles per hour. The slabs of traditional homes will be swept clean and apartment buildings will be completely destroyed. Bennett, Doug. "What Are the Speeds of Tornadoes?" Sciencing, https://sciencing.com/speeds-tornadoes-8266645.html. 25 April 2017.